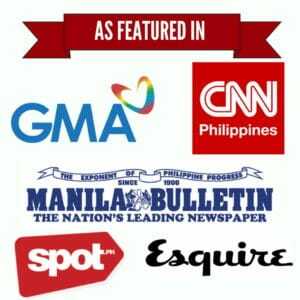 If you’re reading this article, you’ve most likely passed a professional licensure exam in the Philippines. It’s an achievement too elusive for thousands of other Filipinos so be grateful and pat yourself in the back. But as the initial excitement wears off, don’t forget that you have to overcome one last hurdle before you become a licensed professional: the PRC online registration. In this comprehensive guide, we’ll walk you through the specific steps you need to take in order to register and finally get the PRC license you’ve been dreaming of. Who are qualified for PRC online registration? How to Register and Get Your PRC License ID Online: 8 Steps. 2. Sign in to PRC online portal. 3. Select the purpose of your transaction. Option 2: PRC – Cashier. Option 3: UCPB (United Coconut Planter’s Bank). 6. Print the Oath form. 7. Proceed to the PRC office/service center to submit the requirements. 8. Claim your PRC ID and Certificate of Registration (COR). 1. Does PRC set a deadline for the initial registration? 2. I’ve lost my Notice of Admission (NOA). What should I do? 3. Upon signing in, a “For PRC Verification” information pops up. What should I do? 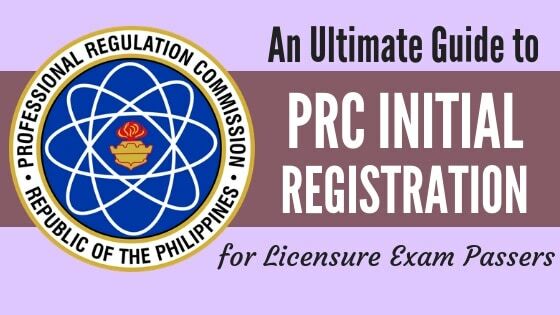 Those who have applied for and successfully passed the licensure exam given by the Professional Regulation Commission (PRC) should proceed with the initial registration. To verify that you’re one of the successful examinees, check the results posted in the PRC website or newspapers of general circulation. The PRC online registration is a mandatory procedure before you can participate in the mass oath-taking and receive your PRC license/ID. The checklist below presents all the requirements you need to prepare for the PRC initial registration. Community Tax Certificate (cedula) – a document you can obtain from the barangay or municipal hall. You’ll need details from the cedula when filling out the Oath form. Printed and duly accomplished Oath form (more on this later). Two passport size pictures. Take note that this is different from the photos you previously submitted during the exam application. The pictures must be 2 x 2 in size, colored, in plain white background, with your full name tag, taken no more than 6 months prior to uploading, and showing you wearing decent attire with collar. Two documentary stamps and 1 piece short brown envelope (can be purchased within the PRC). Notice of Admission or NOA (for identification purposes only). 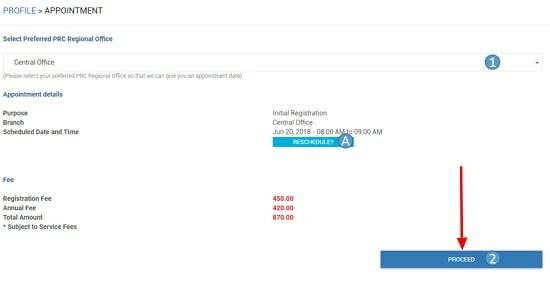 Registration fee (to be paid after securing an appointment online). Although the list above applies to most registrants, the Professional Regulatory Board may request for additional documentary requirements from specific licensure exam passers. Be on the lookout for official announcements posted in the PRC Facebook page after the release of exam results. Access the PRC online portal here. Also known as the Licensure Examination and Registration Information System or LERIS, this is the same website you used to apply for the exam. Since you already have an account, no need to register. Simply sign in with the e-mail address and password you used in your previous transaction. Upon signing in, you will be taken to your profile page containing your personal information and picture. Click “Select Transaction” on the upper right hand corner of the page. Provide the information requested which include your profession (e.g., Professional Teacher) and application number that you can obtain from your NOA. Once you’re done, click “Proceed” to move to the next step. Whether you’re for initial registration, exam application, or PRC ID renewal, you need to schedule an appointment with the PRC for you to be accommodated. Choose the PRC Regional Office or service center where you want the initial registration to take place. If there are available slots left, an appointment date and time will be automatically generated for you. Don’t forget to submit all the requirements (see step 1) to the PRC on your scheduled appointment. The appointment slots are free. Anyone who says otherwise is most likely a fixer who will do under-the-table transaction with the PRC in your behalf and for a hefty price. Avoid them at all cost. Appointments can only be set in advance. You can’t get an appointment with the PRC on the same day that you made the online transaction. Otherwise, you can click the “Reschedule” option below the appointment date and time. This option enables you to select another schedule. Provide the reason for the change of appointment date and proceed to the next step. The online appointment won’t be valid until you pay the required registration fee (see step 1 for list of fees). This mode of payment is ideal for those who want to pay the registration fee online. However, you must have an account with Land Bank (ATM), GCash, or any Bancnet-participating bank for the online transaction to push through. If this is your preferred mode of payment, we suggest reading the instructions we’ve already laid out in our previous guide. If you don’t have a bank or GCash account, you may opt to pay the registration fee at your selected PRC Regional Office or service center on the day of your appointment. Should you select this payment option, a summary of transaction will then be displayed, including the exact amount you’re going to pay. Simply click “Submit” to proceed to the next step. 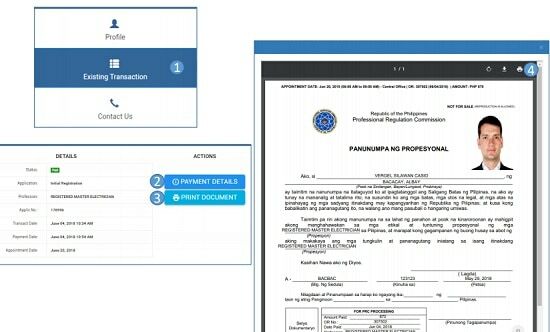 One of the largest banks in the Philippines, UCPB recently entered a partnership with PRC to provide an easy way to pay the registration fee for those who don’t have a bank account. Starting on December 27, 2018, fees for the exam application, initial registration, or PRC ID renewal can now be paid over the counter at any UCPB branch. If you select this option, a pop-up confirmation will appear showing the reference number as well as your appointment date and time. Record or take a screenshot of the said reference number and proceed to any UCPB branch to make the payment. Payment via UCPB are validated within 2 to 3 working days. As soon as the payment pushes through, you will be given a permission to download and print your Oath form. To access the Oath form, sign in to your account and click “Existing Transactions” from the main menu. You will then be given an option to see “Payment Details” or “Print Document.” Select the latter to start printing your Oath form. If you don’t have a printer at home, you may proceed to the main PRC office on your appointment date and time. PRC offers free printing services at its Online facilities located at the PRC Auditorium, 5th Floor, Annex Building. On the day of your appointment, bring the duly accomplished Oath form along with other requirements listed in step 1 of this guide to your chosen PRC office/service center. Submit the requirements at the window number that will be specified to you. Upon receiving the documents, a PRC officer will ask you to sign on the Registry Sheet, also known as the Roster of Registered Professionals. Remember, you can’t participate in the mass oath-taking without signing on the Registry Sheet so personally submitting the documents to PRC is a must. Finally, the officer will give you the schedule of the mass oath-taking as well as a claim slip indicating when you can receive both the Professional Identification Card (PIC) and Certificate of Registration (COR). Both the PRC ID and the COR are usually issued after the oath-taking ceremonies. Mass oath-taking ceremonies are scheduled and administered by the Professional Regulatory Boards (PRBs). In case you failed to attend the said ceremony, you can still claim the PRC ID and COR at the PRC office after 5 working days from the date of the oath-taking. Once you get hold of the PRC ID, you can now legally practice your profession. Take note that the Professional Identification Card is valid for only three years and is renewable during your birth month. My deadline po ba para kunin PRC ID after oath taking? Nag special oath kami ng mga kasama ko Feb 18 2019.Due to work schedules hindi ko oa nakuha ID ko. If i have done my initial registration in one of tbe regional offices of PRC, will I not be able to get my license I.D on the oath taking day?